After iPhone 4s All minds are set to welcome iPad 3. iPad 3 rumors are everywhere nowadays which makes iPad 3 one of the most searched word on the Internet. 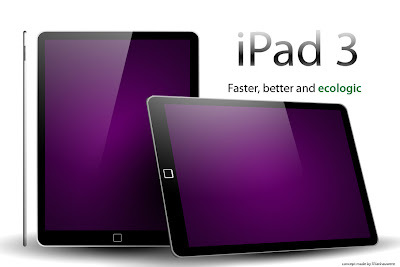 EXPECTATIONS: There are a lot of rumors about iPad 3 and its new features. It is expected that iPad 3 to pack in a 'Retina Display' just like the iPhone 4s, 4 and iPod touch 4. It is also said that iPad 3 will come with a screen resolution of 2048x1536 - Exactly four times the resolution of current iPad (iPad 2). Other features that maybe present include slicker design, More powerful quad-core processor, more RAM, Camera with 1080p Full HD video recording and a Samsung-made AMOLED Display. EXPECTED RELEASE DATE: Rumors go that Apple will announce new iPad on February 24 2012, Steve Job's Birthday. UPDATE: Apple Has finally revealed iPad 3 as 'The New iPad', With iOS 6 the iPad 3 also features Siri and many such features.